Have you ever visited a yoga ashram or spiritual retreat? Perhaps you have wanted to, but been a bit nervous about how they work. Are they only for religious people? What is expected of visitors? What do people do there? Back in 2016 when I set up Bliss Bomb Retreats with my friend and inspirational yoga teacher Jenny, from Yoga For Travellers, we dreamt of sharing our passion for meditation, yoga, mindful movement, stillness, chanting and MORE with regular retreats in Melbourne and overseas. 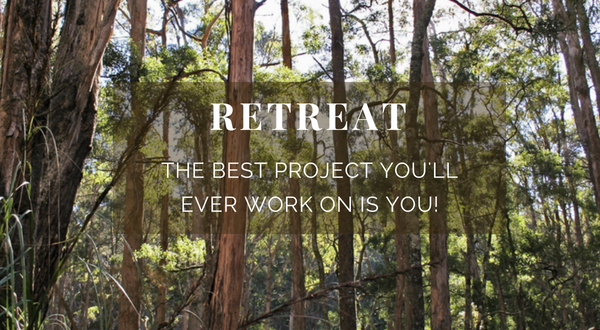 Our first four seasonal retreats were Urban Retreats in a lovely yoga space in Chapel Street, Prahran .. designed around the seasonal practices of yoga and meditation. This year we took a fun road trip to the Rocklyn Yoga Ashram, for some yoga nidra, a vegetarian lunch, time out-of-town, and some country air – and we agreed that this was a magical and unique experience that we would like to share with our community. Quite different from attending a class at home. My own retreat experiences have been more modest; a local one-day silent retreat, a weekend interstate for a meditation retreat, and a few longer international yoga and meditation retreats. I always relish the opportunity to step away from the noise and distractions of ‘regular life’ and spend time in the body, in the mind .. in the silence. To truly live the philosophy of ‘being’ rather than ‘doing’. 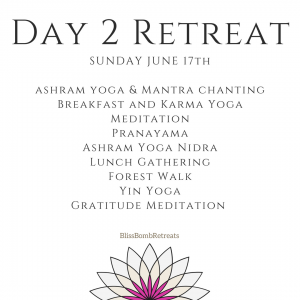 Attending a retreat can be a deeply insightful and transformational practice. SO .. after visiting the Rocklyn Ashram we decided that it would be wonderful to offer others a gentle, friendly and guided experience of the Ashram Lifestyle. Starting 2pm on Saturday 16th June and finishing 4pm Sunday 17th June – this is a unique opportunity to dip your toe into ashram life, with the guidance and support of Jenny, myself and the Ashram community. Spending time at an Ashram is an opportunity to take a break from daily life, to reflect, promote inner calm, and explore stillness; experiencing a range of traditional yoga and meditation practices in an inclusive environment. Everyone is welcome, regardless of religious or other beliefs. 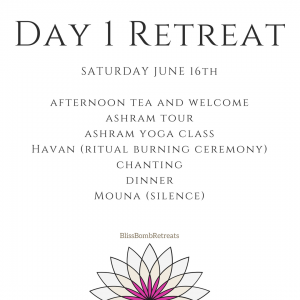 The retreat will offer a combination of ashram activities with other ashram guests, together with a yoga and meditation day retreat with the smaller Bliss Bomb group of retreat participants. 2. $75 paid directly to the Ashram when you register for your overnight stay ($40-$50 for children, depending on their age). The total combined adult price of $270 per person includes all activities, food (dinner, lunch, morning and afternoon teas) and your accommodation at the Ashram. Detailed instructions will be provided once you have completed the online booking.